On June 22, 2015 the new batch of PGDM (e-Business) was welcomed at MET. As part of the induction and in order to foster the passion for business world in the new METizens, an unprecedented platform was created. 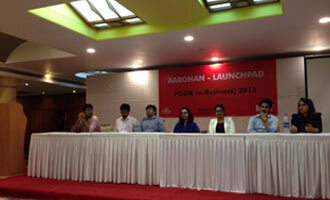 Seven alumni of PGDM (e-Business) from various specializations were invited for an open interaction, these alumni have pioneered various entrepreneurial ventures in multiple areas like – education, equity research, gems, event management, wedding planning, e-commerce, fashion brands and software & hardware.